Optional Single Supplement: $980 USD (number of singles limited). History has given Switzerland little land, but nature has blessed it with the finest natural sights in Europe. The scenic lakes and rivers seem to have a special sparkle. The Alps make Switzerland a truly three-dimensional country; from the air or from the valleys, they are truly spectacular. The cities, while relatively grand, blend charm and comfortable human-scale settings. And the inheritance of several different cultures can be seen in ancient Roman roads and amphitheaters; in monasteries and chapels built for pilgrims; and in Renaissance and Baroque art. Though not often regarded as an "adventurous" touring destination, on our Switzerland tour, you'll discover uber-organized Switzerland can be many things to the traveller. To us it is one of the most culturally-diverse countries in Europe and, without question, one of the most visually impactful. This is truly a land in three dimensions, and our small group, low-impact approach benefits beautifully from our Swiss hosts' efficient and scenic rail system, which we prefer over large buses. This trip never fails to thrill even the most adventurous. Excellent tour. I enjoyed seeing the beautiful highlights of the country: mountains, scenery, local color, and traditions of Switzerland. Swiss rail and bus system is amazing. The only way to travel! All restaurants were well chosen, good selection, local fare if wanted, and very good food! The tour had an amazing itinerary, accomplished my goal to see as much of Switzerland as possible in the 13 day tour, and had no issues or problems concerning our tour, very well handled and organized. I enjoyed all the opportunities to learn of the history of the region and see the many picturesque towns. Everything I experienced was very rewarding. I particularly enjoyed the walk we took down from Schwarzee to the cable car that transported us the rest of the way to Zermatt. I actually enjoyed all the sightseeing elements of the trip. Our tour leader was very caring and made everything enjoyable. The Glacier Express train ride was very long, but I found the views spectacular so I wouldn't have wanted to miss it. The transportation was excellent. The Switzerland Travel Pass not only made travel easy; it also gave us the ability to go to places on our own with ease. The hotels were clean and comfortable. I was very pleased with the Tour Leader and must say that he made this one of the most enjoyable tours I have taken. I thoroughly enjoyed this trip. Loved the trains!!! Every train ride was an adventure. Loved the hotels close to the stations. The cable car rides were the most enjoyable with the boat rides second. Wonder why we waited so long to book this trip. Very happy with great memories. Today we arrive in Zurich. This is a pretty active day, with walking tours in both Zurich and Bern. This morning in Zurich we visit the Fraumunster Cathedral, with its slender blue spire, designed in an orthodox manner. It is small in size but is richly ornamented and adorned with paintings, frescoes and stained glass windows, some of those have been executed by Marc Chagall. The site of the Cathedral was originally a Benedictine abbey established in AD 853, later converted into a Royal Cathedral in the 14th century. The chief attraction of this church are five stained glass windows, each with it's own thematic colour scheme, designed by Chagall in 1970. A short train ride* takes us to Bern, Switzerland's capital city with a medieval town centre (designated a World Heritage Site) dating back to 1191. The old town is framed by the Aare River and offers spectacular views of the Alps. A walking tour in Bern will allow us to see some of the town squares and rows of limestone buildings and medieval arcades, its Renaissance fountains with colourful figures, and the beautiful Cathedral surrounded by picturesque rooftops, Bern is truly a gem of medieval architecture in Europe. Bern is the birthplace of Einstein's relativity theory, cradle of Toblerone chocolate. * PLEASE NOTE: Most of our longer journeys will be accomplished using Switzerland's extensive and efficient public rail service. While the trip overall is not "strenuous" per se, this is an ambitious trip with lots of moving around, train journeys and connections. You MUST be able to manage with your own luggage at rail stations and from station to hotels nearby. This morning a short train ride takes us to Solothurn, regarded as the finest Baroque town in Switzerland, where Italian grandeur is combined with French charm and German practicality. From the 16th to the 18th centuries, the Catholic town of Solothurn was the residence of the French king's ambassador. Fine Baroque and Renaissance buildings, such as the noble Palais Besenval, and magnificent religious buildings greet the visitor at turn; the Old Town has eleven churches and chapels and the same number of fountains and towers. Truly magnificent is the St. Urs Cathedral, with a façade donated by Louis XIV, and an Italian-style staircase in front. Inside are wonderful Baroque stuccos. The town walls, which are still intact in some places, were built according to the principles of the French military engineer Vauban. We reconnect with our baggage (safely stored while touring Solothurn), and then take the train to Montreux on Lake Geneva. We have now left the German-speaking part of Switzerland and entered the French-speaking area. This provides a completely different cultural and historical atmosphere. We have also left the area of snow-capped mountains and entered a region with a Mediterranean climate, an area known as the "Swiss Riviera". Montreux's lakefront boulevards are studded with palm trees. The town is a favourite get-away for rock stars and hosts one of the world's most famous jazz festivals each year. The long, flower-bordered lake promenade which links Vevey and Montreux and then onwards to Chillon Castle is wonderful for an evening stroll. This morning a quick train ride takes us to the charming town of Lausanne on Lake Geneva where we meet our guide for a relaxing walking tour. Many poets and writers, from Wordsworth to T.S. 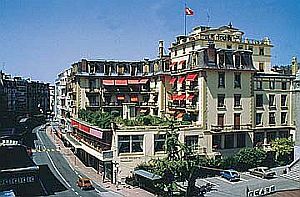 Eliot, have enjoyed the flourishing artistic climate of Lausanne, still an important centre for art and entertainment; indeed, the Palais de Beaulieu and the Theatre Municipal frequently host dance and musical performances. At the centre of the old town is the Place de la Palud lined by old houses and the Renaissance facade of the Town Hall. In the square is the charming 17th century Fountain of Justice. The nearby 15th century Castle St-Marie is today the seat of local government, and the 12th century Cathedral is considered one of the finest Gothic buildings in Switzerland. The town is also the home of the International Olympic Committee and has a museum to the Olympic Games, which we visit after connecting with our bus transport. We continue by bus to the picturesque town of Gruyeres in the Canton of Fribourg. The main street is lined with 15th and 17th century houses with twin windows and wide eaves. The cobbled street slopes down to the town fountain before rising again towards the castle. The 15th century castle affords excellent views of the wooded slopes and jagged mountains rising all around. We tour the castle which was formerly home to the Counts of Gruyeres. After some free time (our Swiss Pass includes entrance to any museums of interest) and dinner in Gruyeres, we return to Montreux. A short train ride from Montreux takes us to Fribourg, nestled on a rock promontory and surrounded on three sides by the Saane River. Fribourg is one of the largest medieval towns in Uechtland. Over 200 unique Gothic facades from the 15th century impart medieval charm to the Old Town. Ramparts that are over two kilometers long used to protect the city in the past. Most impressive, however, is the Cathedral of Fribourg with its extraordinarily beautiful stained-glass windows. Construction started in 1283 and continued in several stages; dedicated to St. Nicholas, it boasts a 74-meter-high tower that offers a fantastic panoramic view. Today's relaxed walking tour takes in the highlights of the city, a very "walkable" town. We continue by train to Interlaken for a three night stay. The name 'Interlaken' implies "between the lakes" -- as it lies between Lake Thun and Lake Brienz, with water omnipresent throughout the area with idyllic clear mountain streams and waterfalls running off the hills and into the lakes. 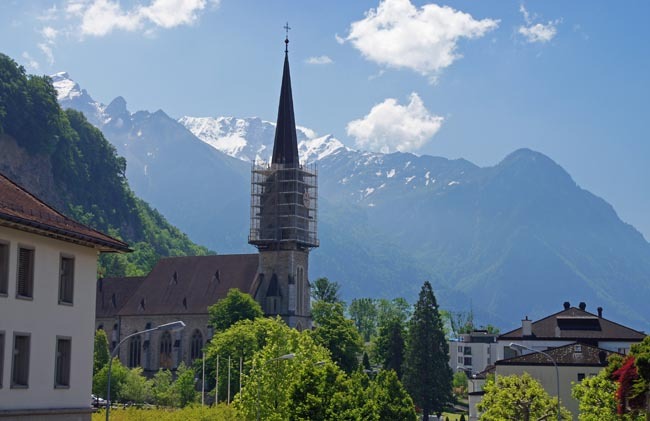 Today we make a full day excursion out of Interlaken by train and cog railway to see the spectacular Jungfrau Mountain set amid the peaks and pastures of the Alps. Weather permitting, today's excursion takes us to over 3300 m (11,000 feet) and so should not be undertaken by anyone with a heart condition or breathing problems. En route we pass below the Eiger Mountain and see the Eiger Glacier. After travelling 6 km (4 miles) through a tunnel in the mountains we emerge at Jungfraujoch, the highest railway station in Europe. From here, on a clear day, we can see the immense Aletsch Glacier in one direction and the whole of the Interlaken area laid out below us in the other. Returning in a circular route via Wengen we arrive back in Interlaken. Today we have a train day-trip to nearby Lucerne. The over 600 year old covered bridge in Lucerne is one of the most recognized symbols of Switzerland which makes the city a major destination for travellers from all over the world. However, Lucerne and the region around Lake Lucerne are also the heart and soul of this country. It was in this region that in 1291 Switzerland was founded by the oath of the representatives of the first three cantons. Lucerne is situated on both sides of the Reuss River where it exits Lake Lucerne. The old town is charming with narrow streets and buildings in many styles. Lucerne is particularly famous for its covered wooden bridges. The watertower on the restored Kapellbrucke is a well-known landmark. The intact Spreuerbrucke features painted scenes inside illustrating "The Dance of Death". After spending some time enjoying the delights of Lucerne we take the train back to Interlaken and have the evening free to explore the pretty village on our own. This morning we travel by train into the mountains to the ski resort of Zermatt. This relaxing town has no cars (electric taxis are the only motorized transport) and sits in the shadow of the magnificent, jagged peak of the Matterhorn. The views of the 4478 m (14,692 feet) mountain are stunning. You feel so close that you could reach out your hand and touch the peak! We take the famous Gornergrat cog railway from Zermatt across stunning bridges, through galleries and tunnels, idyllic forests, past gorges and mountain lakes with the Matterhorn continually in the field of vision, to the observation at Gornergrat located at a height of 3,089 metres. Surrounded by 29 four-thousand metre high peaks, by the highest Swiss mountain (Dufourspitz in Swiss, better known as Monte Rosa) and by the third-largest glacier in the Alps (Gorner Glacier), it offers a mountainscape panorama that couldn't be more overwhelming. The balance of the day is free to explore Zermatt. 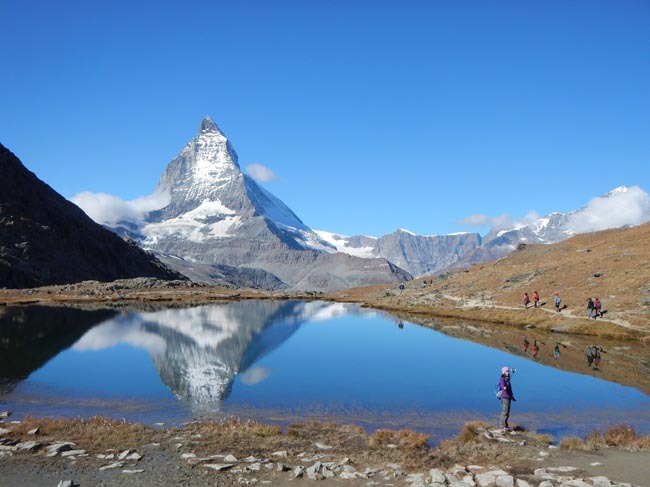 For those who wish to have a closer view of the Matterhorn and would enjoy some gentle hiking, we make an excursion to the foot of the Matterhorn. The first section of our ascent is by cable car to Furi -- 1865 m (6,119 feet). From here we take a second cable car to Furgg -- 2434 m (7,985 feet). 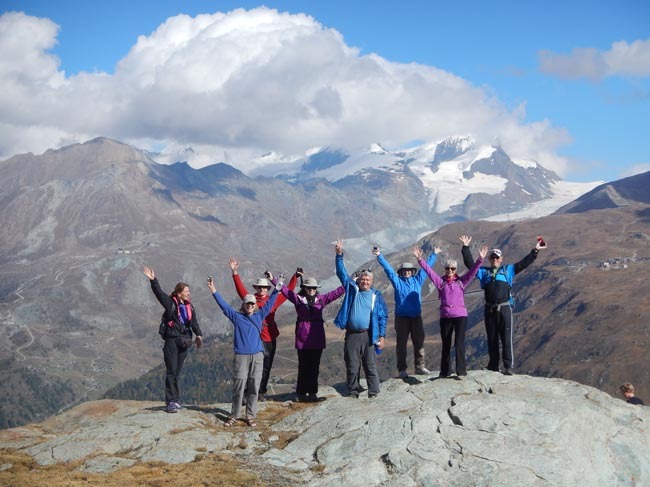 The views here of the Theodul Glacier and surrounding Alps are awe-inspiring. Another short cable car ride takes us to the plateau below the Matterhorn where there is a small lake called the Schwarzsee (available only on late summer tours). In this flat area we walk a path around the lake drinking in the mountain vistas and savouring the fresh mountain air. There is a beautiful spot for a picnic near an old chapel by the lake. After our easy-paced walk we return by cablecar to Zermatt. Please note that if the weather is poor other sightseeing will be substituted this day. For those who do not wish to join today's excursion, the day is free to enjoy the wonderful mountain panorama and clean mountain air from the town of Zermatt itself. Today we take the spectacular Glacier Express train ride. Round every corner are mountains and more mountains, small villages, cows with clanking bells, glaciers, blue lakes and rushing rivers. The full length of the Glacier Express route from Zermatt to St Moritz passes over 291 bridges and through 91 tunnels. For much of its journey, it also passes along and through the World Heritage Site known as the Rhaetian Railway in the Albula / Bernina Landscapes. The train is not an "express" in the sense of being a high-speed train, but rather in the sense that it provides a one-seat ride for a long duration travel. In fact it has the reputation of being the slowest express train in the world. The entire line is metre gauge (narrow gauge railway), and large portions of it use a rack-and-pinion system both for ascending steep grades and to control the descent of the train on the back side of those grades. We arrive in St Moritz late this afternoon and transfer to our hotel. This region has many significant mountains and ski resorts, the most famous of which, and possibly the most famous ski resort in the world is St. Moritz. The town lies in two parts beside Lake St Moritz, and is located at 1856m (6,089 feet) and surrounded by mountain peaks, such as Piz Nair at 3057m (10,027 ft). The resort is still very exclusive and expensive, attracting the rich and famous, attracted to, among other things, the healing powers of its mineral waters. Travelling by road today allows a quick stop in the town of Zuoz on the way to Zernez. Imposing, palatial houses bear witness to the turbulent history of this village. 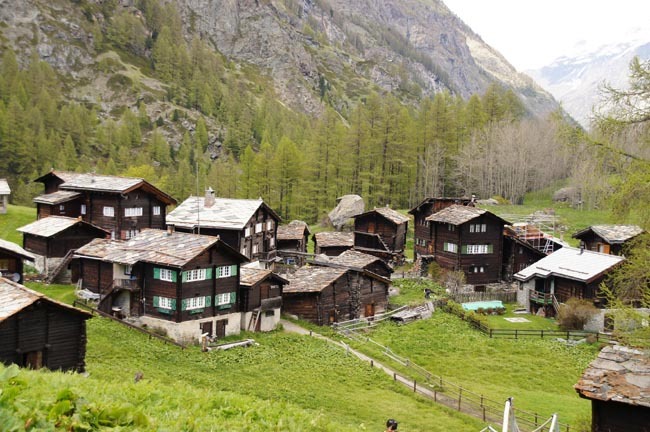 Until the 19th century, Zuoz played an important role on the political and cultural scene and today is one of the best preserved villages of the Upper Engadine. We then explore the museum and the town of Zernez and have a break for lunch. If the weather is nice we would stop at Diavolezza for a gondola ride up to about 3000m height (May only; September tours will return to St Moritz and go up one of the hills there after a walk in town). We return to St Moritz and walk through the village where winter tourism was born. From St Moritz we travel by bus (a train-free day) to the Principality of Liechtenstein, one of the world's smallest states with one of the highest per capita incomes. Lying on the right bank of the River Rhine between Switzerland and Austria, Liechtenstein is only 160 sq km (61 sq miles) in size with a population of less than 30,000 -- one third of whom are foreigners. Although Liechtenstein's independent status allows it to be a tax haven, the functioning of the country is heavily integrated with that of Switzerland. There are no border formalities involved in crossing between the two countries but you can get a Liechtenstein stamp in your passport. Liechtenstein uses the Swiss phone and postal systems, the Swiss Franc is the local currency, and Liechtenstein is represented abroad by Switzerland's diplomats. However, Liechtenstein has no army, is a monarchy, and issues its own highly-collectable postage stamps. The capital city, Vaduz, is built around the castle. We explore the narrow streets and visit the National Museum. This afternoon we return to Switzerland and make our way to St Gallen, where we will likely have time to accomplish some of our area sightseeing upon arrival. This morning we explore the Old Town of St Gallen. The town became exceedingly prosperous in the 16th, 17th and 18th centuries due to the linen industry. In the streets leading off the Marketplatz there are many handsome 17th and 18th century houses. St Gallen's most famous attraction is its cathedral, part of which dates from the 10th century. Here we see the colourful ceiling paintings and visit the library. From St Gallen we make our way by train to the delightful town of Appenzell, one of the most traditional towns in Switzerland. Here many folk arts flourish and many houses have whimsical paintings on their walls. With about 7,000 inhabitants, Appenzell is the cultural center of Appenzell Innerrhoden, the smallest Swiss canton. The car-free village beckons with pretty lanes and myriad small stores and boutiques that are ideal for browsing. The facades of the buildings are decorated with frescoes and Appenzell Museum located in the town hall, shows a cross section of Appenzell's history and culture. Continue by train to Zurich. 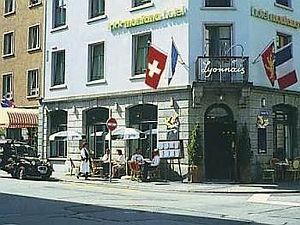 The Best Western Hotel Montana is located 300 metres from the Zurich main station and close to the Sihl River. ...	offers stylish rooms, fine French cuisine and free Wi-Fi. All rooms are equipped with a satellite TV, a minibar and a safe. All sights and attractions of Zurich can be easily reached on foot or by public transport. 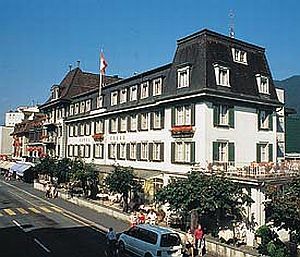 Centrally located, just a short foot walk from the train station Interlaken West, the Hotel Krebs is equally popular with ...	travellers and tourists. The 2008 renovated 44 rooms and suites are modernly furbished and boost friendly colours. In the interest of guests, Hotel Krebs exclusively disposes of non-smoking rooms. The use of internet and WiFi is free of charge. In front of the Casino and at 200 meters from the lake, the hotel is located in the heart of ... It is an ideal start to the main tourist attractions of the region. 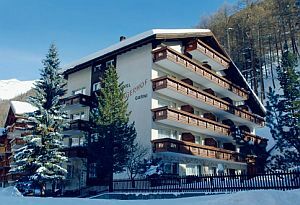 The Hotel Jägerhof is situated just outside the village centre of Zermatt and most of the rooms offer a fantastic ...	of the Matterhorn. The village centre is easily reached from the hotel on foot. 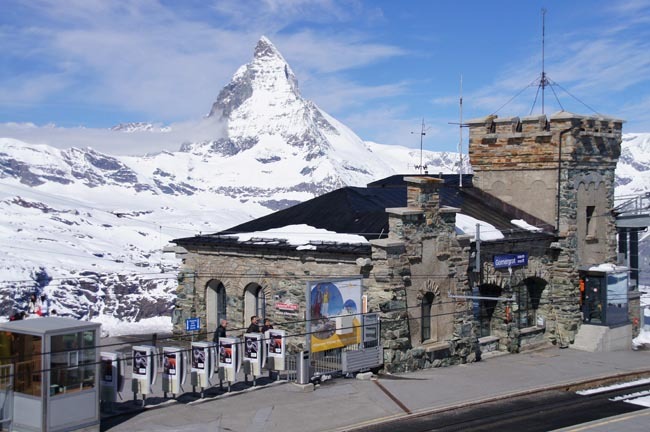 It is also only a five minute walk to the Kleinmatterhorn cable-car station. 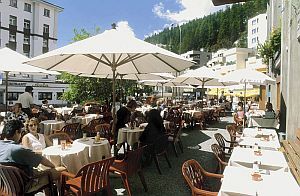 "In the heart of St. Moritz, our restaurant offers an excellent range of specialties such as homemade sweets and the ...	patisserie from our own confectionery. We are eager to create a relaxed atmosphere for our guests at all times and to ensure that their stay is a comfortable one. Our hotel is a friendly place, where we aim to fulfill even the smallest needs of our guests in our own unique way." Breakfast and dinner (mostly local restaurants) daily. All transport, accommodation, sightseeing and entrance fees for sites noted as 'visited' in the detailed itinerary. Gratuities for driver, restaurant staff, porters (if available) Airport transfers for land & air customers arriving / departing on tour dates. 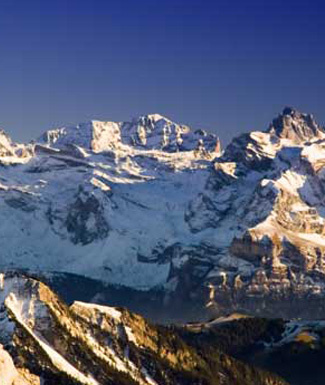 The Alps cause many climatic variations throughout Switzerland. In the higher Alpine regions temperatures tend to be lower on average, while the lower land of the northern area has higher temperatures and warm summers. Temperatures are likely to reach the teens C and 20's C (60's and 70's F) during the day, with cooling breezes and occasional rain. At night the temperature will drop quite a bit, depending on the altitude. Mountain weather is fickle. It can range from blue skies with the temperature in the low 20's C (70s F) to cloudy, wet, cold days on which rain gear and warm garments are necessary. Local land transport provided by private bus, 16-24 seats depending on ultimate group size (see 'group size'); local bus, taxi, and train. Numerous walking tours on uneven / cobbled surfaces. Most of our longer journeys will be accomplished using Switzerland's extensive and efficient public rail service. While the trip overall is not "strenuous" per se, this is an ambitious trip with lots of moving around and train journeys and connections. You MUST be able to manage with your own luggage at rail stations and from station to hotels nearby. Hotels are usually located very near stations, which usually have escalators where applicable. Wheeled bags, NOT hard-sided baggage, are best as you will likely be transporting your luggage from hotel to station. The importance of packing light cannot be overemphasized. Given the nature of this itinerary you will walk with your luggage more than you may think. Remember that with train travel you keep your luggage with you throughout the journey; putting it on the racks above your seat, between the seats or at the end of the car. There is usually no separate baggage car. Unlike travelling by air, you do not check your bags in. Yes, you can access to your bags throughout the journey. Mid-range (3*), well-located, air-conditioned, simple hotels and inns throughout. Many are smaller properties (2-3 story) and may not have elevators. All hotels have en suite toilet and bath, though some will have shower only (no tub). Porters may be available (see 'Inclusions'), though you must be prepared to manage your own luggage to and from your hotel room.